With the initial roll-out of LAANC just a few weeks away, we’ve been hard at work integrating native, seamless, and beautiful LAANC functionality into our platform (but more on that later ;). Today we wanted to dig into the numbers and dissect *why* there’s such a fervor around LAANC. Aviation is full of acronyms, and there’s no better example than LAANC — or Low Altitude Authorization and Notification Capability. LAANC was developed over the last year in a collaboration with government and private industry to open the national airspace to drone operators, replacing a ~90-day manual process to receive authorization to fly in controlled airspace, down to seconds via an API. This is a critical step in evolving the airspace and automating processes, without sacrificing safety for manned or unammned flights. 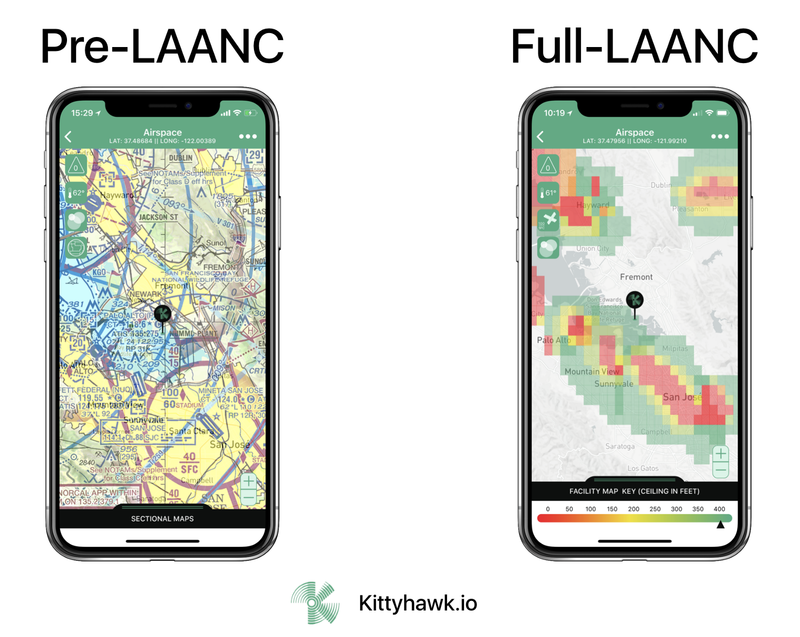 What LAANC really means for commercial drone operators is a quick and unambiguous method to request flight authorizations in controlled airspace. The FAA has essentially replaced a blackbox method that took months to a precise method that happens immediately. For commercial pilots, the airspace will start to look a lot different. Replacing swaths of no fly zones with readily accessible controlled airspace. Since our founding, we’ve been a strong advocate for the advancement and openness of our industry, highlighted by our focus on making LAANC available in the open market. 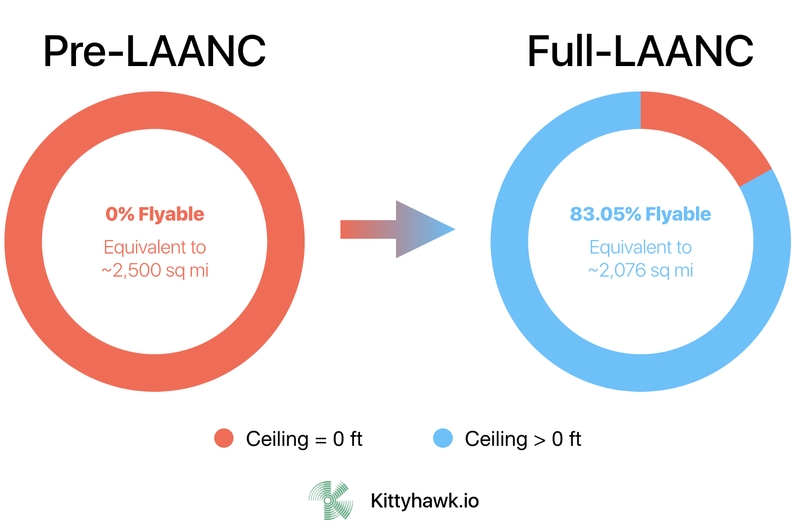 That day is just around the corner, as the FAA will begin rolling out LAANC to different regions beginning April 30th in the South Central region and culminating in the Central North region in September. Many of our customers estimate that they’ll be able to double the number of commercial flights they can do nationally once the LAANC rollout is complete. Based on the numbers below, we think those bullish views underestimate the actual potential. LAANC will not be impactful purely through speed. Vast amounts of previously onerous airspace will become accessible across the National Airspace. We’re excited at the opportunity that authorization wait times in seconds instead of months for authorizations will bring to the commercial drone industry once LAANC is rolled out across all major regions by the Fall of 2018. However, once we started analyzing the numbers, it became clear the largest impact isn’t speed. It’s area. And that’s even more exciting. 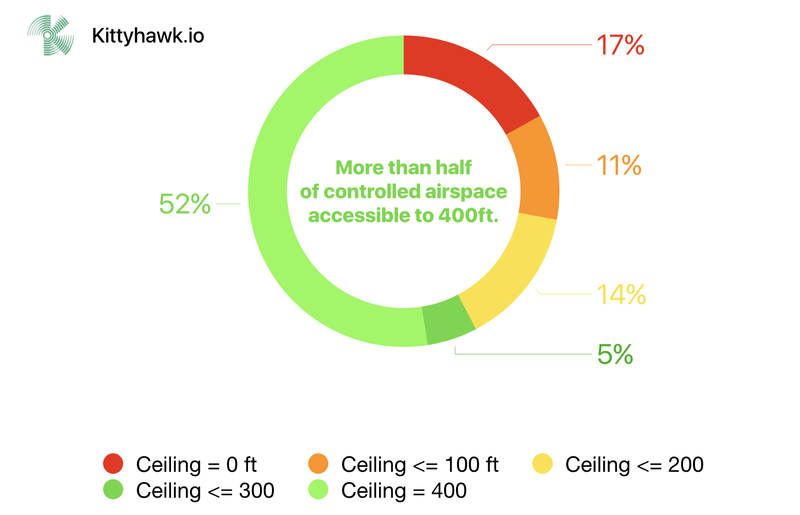 Question: What percent of controlled airspace has a zero foot ceiling? Based on the latest UAS Facility Map (UASFM) data, a new feature we’ve recently integrated into our applications, only 16.95% of the airspace is not immediately accessible with LAANC. The other 83.05% has greater than a zero-foot ceiling. In essence, those broad 5-mile no-fly-zones are being whittled down to less than a mile per airport. Extrapolating this across the ~500 LAANC airports around the country, this equates to more than 2,000 square miles of newly accessible airspace. Just 16.95% of controlled airspace will not offer immediate access to fly. Assuming that FAA Part 107 pilots comply with other LAANC-related requirements for immediate authorization, this means that vast majority of controlled airspace is opening up… But at what altitudes? Surely not more than 100 feet or so, right? Question: What percent of UASFM is accessible up to 400 feet? More than half of UASFM grids have a maximum ceiling of 400 feet. This is intuitive and why many of us have been advocating for more granularity in airspace regulations, but it’s backed up by data that airport operators submitted to the FAA in creating the facility maps. The bulk of new airspace is accessible at significant altitudes. The combined impact of these two metrics mean that some of the most valuable airspace for sUAS operations is opening up meaningfully — both in area and ceiling. In short, yes, there is very good reason to be excited for LAANC. Contact us anytime for platform questions at team@kittyhawk.io or sales/partnership inquiries at sales@kittyhawk.io. No Replies to "Knowledge Base Presented By Kittyhawk "LAANC In-Depth""